Our show is going to be amazing! Family-friendly, but definitely not just for kids, a vaudeville extravaganza unlike anything Kingston has seen before. Showtime is 7 pm on Saturday, October 25 in the beautiful Auditorium of Kingston Collegiate and Vocational Institute (KCVI) at 235 Frontenac Street (directions here). Tickets are just $15, $7.50 for kids 12 and under. You can buy them online (adult tickets only, $1.52 service charge) or get them at the Festival and at the door to the show! We are reserving a block of tickets for Festival attendees. Our stars are The Smirk Show, all the way from Boulder, Colorado. 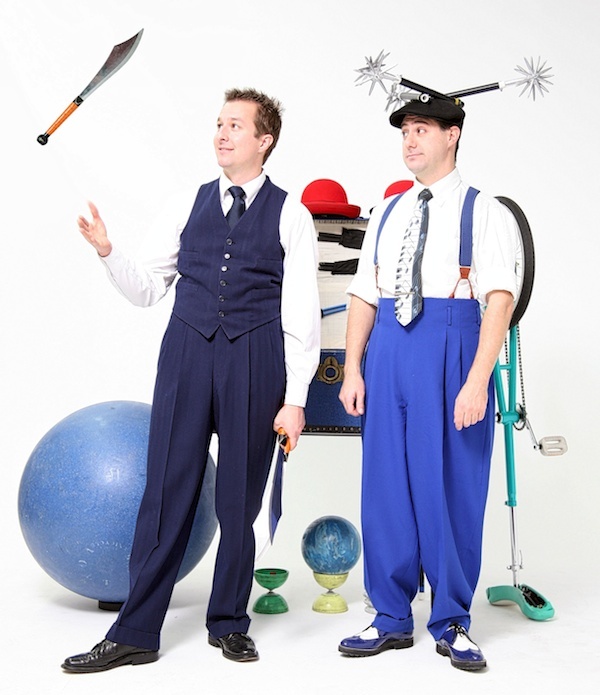 Smirk is juggling ace Warren Hammond and physical comedian Reid Belstock. Reid plays a maniacal goofball to Warrenâ€™s straight man, yielding a crazy collision of Abbot and Costello with juggling â€” hard tricks, amazing stunts, and side-splitting laughs. 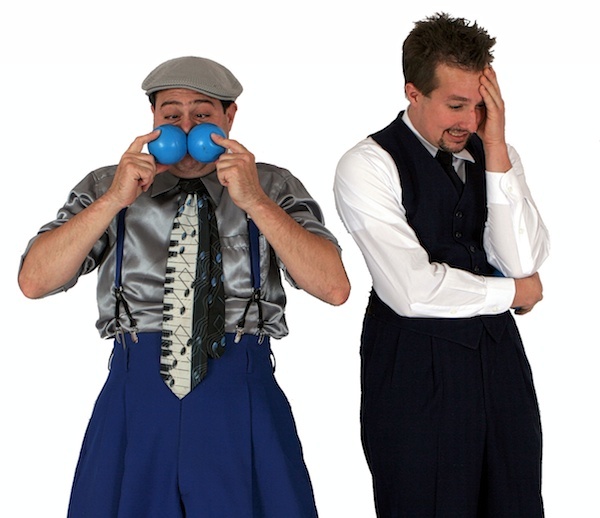 Described as "a nicely matched pair of performers with a deep bag of tricks" by Juggle Magazine, their juggling and slapstick antics explode off the stage to fill the largest auditorium. 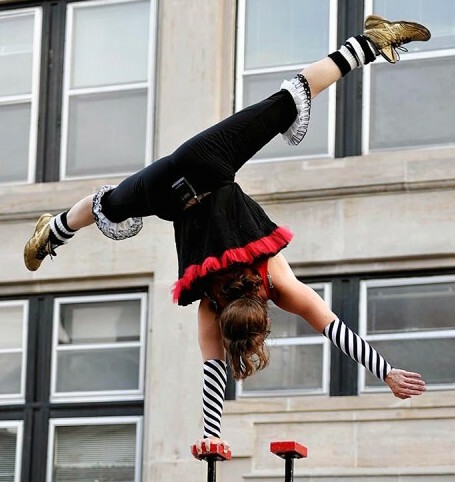 Their work has earned them multiple awards, including the 2009 and 2011 International Jugglersâ€™ Association Silver Medal in team stage competition. 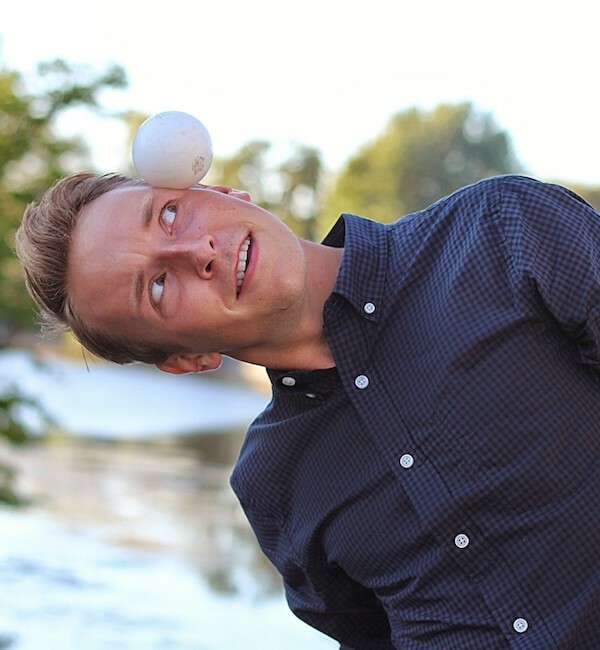 Your Master of Ceremonies is Joe Showers, a ten year juggling fanatic from Rochester, New York. Not satisfied just tossing balls, he's diversified into hula hoop, ping pong balls, Chinese yo-yo, spinning tops, kendama and even tricks using just his fingers. Heâ€™s delighted to be hosting our show and to share everyone's unique talents, including his own. Dominique Rabideau is an evil mad genius currently hailing from MontrÃ©al, QuÃ©bec. When not plotting her takeover of the world, she splits her time between constructing elegant pastries and performing equally elegant juggling. 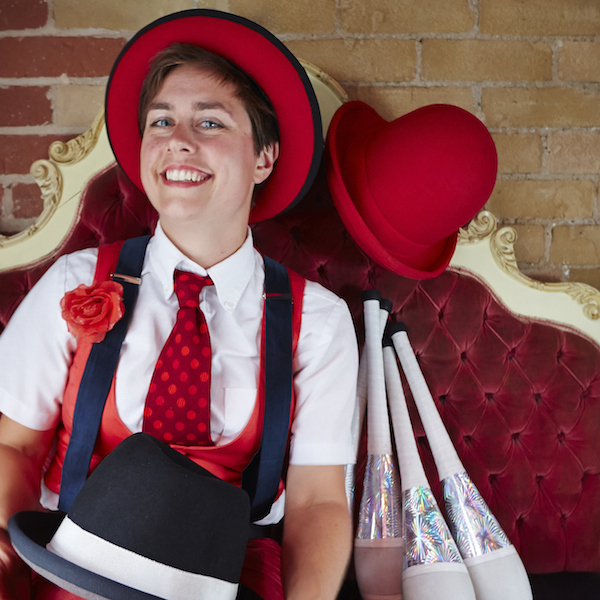 Known for her smooth stylings, sassy attitude and infectious grin, Dominique is delighted to be coming to the Limestone City Juggling Festivalâ€™s premiÃ¨re stage. Cate Flaherty from Boston, Massachusets is a native of sunny Florida and an alumni of snowy Ã‰cole de Cirque de QuÃ©bec. Sheâ€™s been lavished all kinds of praise and won all kinds of awards, including the title of 2011 IJA Busking Champion, (which everyone agrees sounds pretty impressive), and is just pretty darn great in a general sort of way. If heâ€™s not sleeping, heâ€™s probably juggling. Based in Ottawa, Yoshi Chladny has been performing for the past ten years. He trained professionally, and taught at the Verdun Circus School in Montreal. His passion for juggling has drawn him to perform across Canada, the United States, and as far as Dubai. He has appeared several times on national television, winning the grand prize on YTV's Zoink'd. 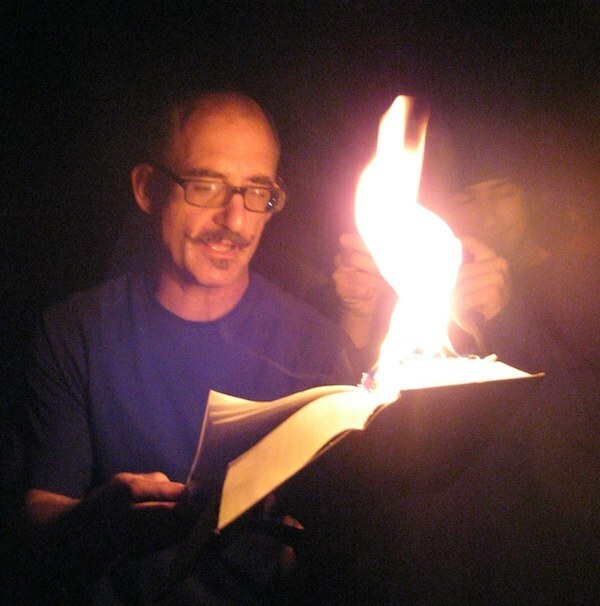 Jeff Peden of Rochester, New York, began his performing career in 1987. 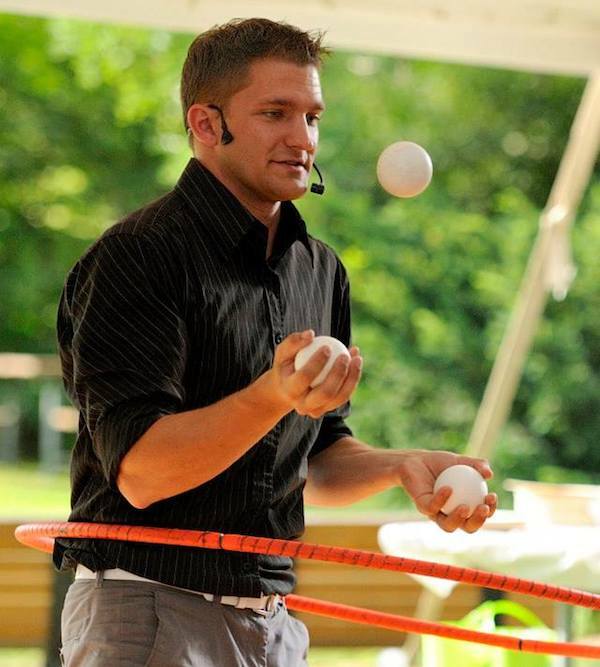 Since then he's won numerous juggling awards, served as President of the Rochester Juggling Club, taught juggling at the Rochester Institute of Technology and acted as a circus skills consultant and show producer. His training includes intensive workshops with professionals from the San Franciso Circus School, Cirque De Soleil, and Ringling Clown College as well as degrees in History and Education. 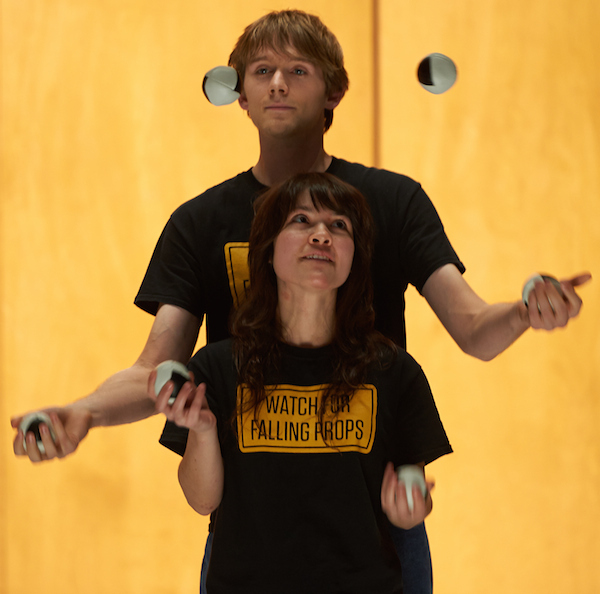 From Guelph, Ontario, Mike Moore and Emily Carlson mix mind-bendingly complex partner juggling with a sweet and playful stage presence. In the real world, Mike and Em are both science graduate students, but on the festival stage they bring a special kind of magic that always delights. From Kingston, Ontario, Jordan Cross is one of our own. 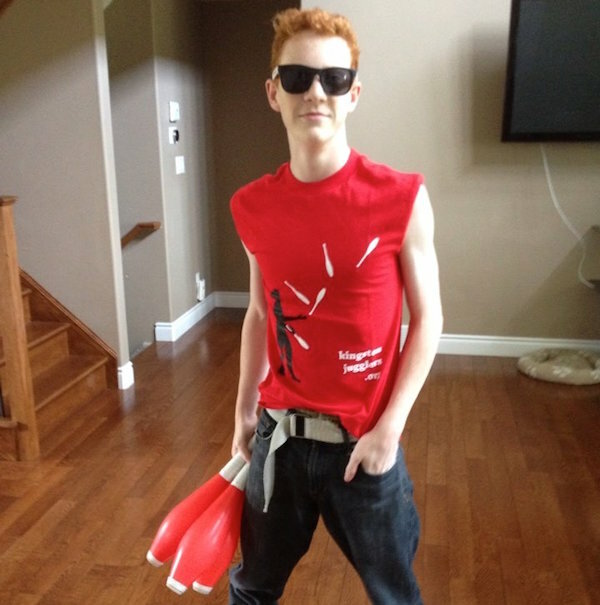 Still in high school, he's already a seasoned performer after making his debut at the 2014 Kingston Busker's Festival. We look forward to welcoming him to the Festival stage!